When getting attention at the club is how you roll and you like wearing high fashion looks that grab peoples attention, Zota shoes make the style for you. 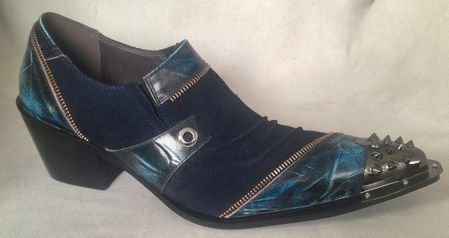 Zota has been specializing in these head turning style shoes for men for several years that have unique and pointed toe looks with a complete disregard for boring. If there is one thing that Zota does well is that their high fashion shoes are not boring. These blue leather loafers with Cuban style heel feature a slip on style ready to mix and mingle in the crowd.